Our focus is integrity and courteous service! If your car, van, or truck is in need of service, you can request a quote or schedule an appointment online, now. AutoWorks will provide you with an estimate for your car, van, or truck that reflects reasonable rates; AutoWorks will do the job efficiently and get your vehicle back on the road fast. AutoWorks provides 12 months/12,000 miles warranty on all parts and 6 months/6,000 miles on labor. Our staff of ASE-Certified professionals can work on domestic and foreign cars, vans, and trucks. Bring you car, truck, or van to AutoWorks for fast and efficient service, whether it be for an oil change and tires or water pump and brakes. We do it all from AC system repairs to wheel alignments. AutoWorks’ technicians can diagnose and repair all systems and components in your vehicle, including AC, alternator, battery, belts, brakes, CV joints, electrical, engine, radiator, steering and suspension, tires, and water pump. AutoWorks technicians will visually check your vehicle for major systems and components and its exterior condition; they will check under the hood; they will check all fluids; they will check under the vehicle; they will check the brakes; they will check the tires. AutoWorks has all of the latest technologies and equipment to provide analysis for older vehicles and the latest model cars, vans, or trucks. And our ASE-certified technicians keep up-to-date with all changing technologies. AutoWorks’ technicians take vehicle performance and safety very seriously. Any time you bring us your car, van, or truck for repairs, we will check all systems and components to make sure that your vehicle performs at its best. We use the highest-quality brands and parts and provide you with a 6 month/6,000 mile warranty. AutoWorks is your trusted auto repair shop in Delray Beach, Florida. Our ASE-certified technicians will get your car, van, or truck fixed and on the road in no time. AutoWorks is an independent, full-service auto repair shop. We’ve been operating at the same, west-Delray location for more than 30 years. A new management team is dedicated to continue the tradition that made the shop one of the most dependable, courteous, and honest repair facilities in Palm Beach County. Certified Master Technicians specialize in diagnosis and repair of all makes and models of American as well as Japanese and Korean vehicles. AutoWorks offers more than 30 different types of services. In addition to being able to diagnose, replace, and repair major automotive systems and components, AutoWorks provides a complimentary visual inspection report, friendly and courteous customer service, affordable pricing, quick turnaround, shuttle service, and warranties on parts and labor. and see what we can do for you today! In addition to our car service, AutoWorks provides exceptional service and maintenance for your pick-up truck or van. Our ASE certified technicians have many years of experience working on all makes and models from F150s to RAM 3500s, including dually trucks. And our new heavy-duty lift makes servicing your truck or van as simple as possible. 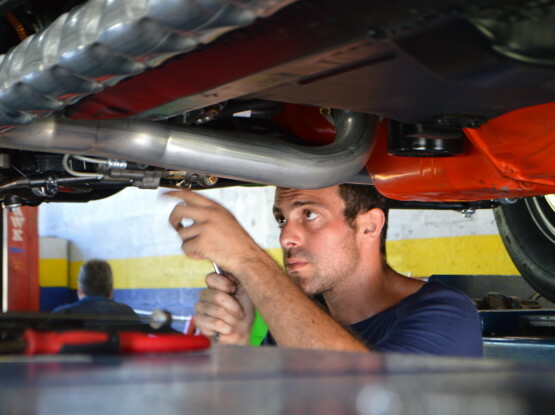 AutoWorks is located in a large free-standing facility on SW 10th Street, just west of downtown Delray Beach, and just east of Congress Avenue. We have 7 bays and 6 lifts, including an alignment lift system. And we have updated and upgraded equipment and advanced diagnostic software. Stay up-to-date on automotive issues by reading our latest blogs. We at AutoWorks want you to keep your vehicle safe and working at all times.